With a stay at Allerton Court Hotel, Sure Hotel Collection by Best Western in Northallerton, you'll be within a 15-minute drive of Yorkshire Moors and Romanby Golf and Country Club. This hotel is 7.2 mi (11.6 km) from Mount Grace Priory and 7.5 mi (12 km) from Kiplin Hall. The Black Horse Inn is set in the heart of the village of Kirkby Fleetham, in the North Yorkshire countryside and benefits from free parking. Each of the seven en-suite bedrooms offer free WiFi, flat-screen TV’s and free toiletries. It also features One AA Rosette Restaurant serving traditional British pub food prepared using regional ingredients, a Bar serving Real Ales and a Garden. Catterick Racecourse & Yorkshire Dales National Park are a 10 and 40 minutes drive away, respectively. When you stay at Black Bull in Northallerton, you'll be convenient to Romanby Golf and Country Club. 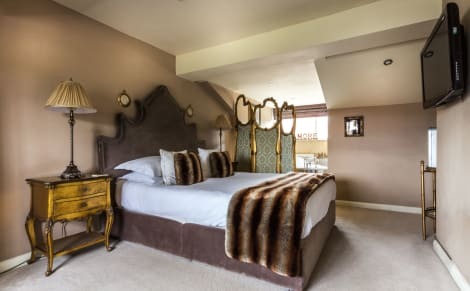 This inn is within the vicinity of Mount Grace Priory and Mount Grace Priory.Rooms Stay in one of 6 guestrooms featuring flat-screen televisions. Complimentary wireless Internet access is available to keep you connected. Conveniences include coffee/tea makers and irons/ironing boards, and housekeeping is provided daily.Amenities Enjoy the recreation opportunities such as a nightclub or make use of other amenities including complimentary wireless Internet access.Dining Enjoy a satisfying meal at a restaurant serving guests of Black Bull. Quench your thirst with your favorite drink at a bar/lounge. A complimentary full breakfast is served daily.Business, Other Amenities The front desk is staffed during limited hours. Free self parking is available onsite. Northallerton is a charming market town in North Yorkshire, in the north-east of England. With a history stretching back to pre-Roman times, the town has an interesting heritage and many fascinating attractions. Add to this its proximity to the Yorkshire Dales and Yorkshire Moors, and with Northallerton hotels you are definitely on to a winner. Your adventure back in time to Northallerton's illustrious past need not take you far. The town's pleasant High Street has some fine examples of Georgian architecture and a real buzz, with plenty of independent shops, cafés and pubs. Barkers of Northallerton is a great old-fashioned department store where you can pick up everything from a designer handbag to new curtains. After a day of shopping, pop in to Betty's Café Tea Rooms for a quaint cup of tea in a romantic Georgian setting. If you are after something more substantial than a scone, the White Horse Café has excellent fish and chips and other British classics. When you've sated your appetite, head to lovely old pub The Fleece Inn to quench your thirst. There is also a busy market on the street on Wednesdays and Saturdays, where rare bric-a-brac can be found next to fresh fruit and veg. Northallerton has an incredibly interesting history, with the height of its importance coming in the 11th century, when it became a centre for religious affairs in the north of England. Not long after this, the All Saints Church was built in the town centre. The church is well worth a visit. Another symbol of the area's religious past is found just outside of town in the ruins of the 14th-century Mount Grace Priory. The walk to the site is one of great beauty, as you pass through the beginning of the North York Moors. Mount Grace was the last monastery established in Yorkshire before the Reformation and today it is a jumble of beautiful and archaic ruins perfect for exploring on a summer's day. With two national parks so close, the Yorkshire Dales and the North York Moors, Northallerton is a great place to visit for outdoor enthusiasts. The Dales are known their dramatic landscape of rolling hills and wooded valleys. When visiting, make sure you see Aysgarth Hills, a series of stunning waterfalls set in luscious woodland. Wensleydale is the most famous of the dales because of the delicious cheese made there. Take a walk from the Hadrow Force waterfall to Wensley where you can sample some of the celebrated local product. The North York Moors contain rugged moorland and ancient villages. Farndale is a picturesque town surrounded by fields of wild daffodils. Walk from here to Pickering, a beautiful spot and home to an ancient castle. The town is also the starting point of the North Yorkshire Moors Steam Railway which runs through the Moors to the famous Gothic coastal town of Whitby.